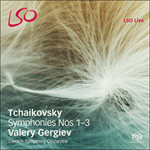 Composed between two of his most popular works, the First Piano Concerto and Swan Lake, Tchaikovsky’s Third deliberately avoids the expression of any deep personal emotion but demonstrates instead the composer’s growing involvement in a wider and more objective symphonic tradition. It was written in the summer of 1875, when Tchaikovsky was free of his teaching duties at the Moscow Conservatory. Visiting the country houses of friends and relatives, he drafted the symphony in barely two weeks and then took enormous trouble over the final orchestral score. It was first performed on 19 November 1875 in Moscow, conducted by Nikolai Rubinstein. The nickname ‘Polish’, which seems to have been coined when Sir August Manns gave the symphony its first British performance at the Crystal Palace in 1899, is quite irrelevant. While the Second Symphony is known as the ‘Ukrainian’ or ‘Little Russian’ because it makes prominent use of Ukrainian folk tunes, the finale of the Third features the polonaise not as an expression of national colour but simply as a stylised dance rhythm. Tchaikovsky was consciously moving away from his brief but close involvement with the Russian national composers, finding their dogmatic approach too restricting. Instead of a heavy dependence on folk themes, which may be colourful in themselves but tend to be self-contained, Tchaikovsky is here working with material that is on the surface less distinctive, but which allows for more elaborate development and more subtle relationships between themes and movements. Even so, every detail of the symphony bears the personal stamp of a the composer who admitted that “As regards the Russian element in general in my music… I grew up in the backwoods, saturating myself from earliest childhood with the inexplicable beauty of the characteristics of Russian folksong”. Tchaikovsky’s only symphony in a major key opens with a minor-key introduction, Tempo di marcia funebre, but this funeral march is more an indication of style and tempo than any particular expression of grief. Halting phrases in the dominant key build up suspense with a gradual acceleration towards the main body of the movement, whose three themes are treated with many inventive rhythmic shifts. The three central movements are more lightly scored. The Alla tedesca, a German dance, is in George Balanchine’s description “another of Tchaikovsky’s marvelous waltzes, a whole ballet scene exquisitely orchestrated”. The central trio keeps the same basic pulse but sounds faster because of the shorter note-values, a stream of quaver triplets with a distinct flavour of Schumann or Mendelssohn. The wind solos that open the deeply expressive slow movement mark it as both the most Russian and the most personal music heard so far. The triplet figures that appear later can be heard as a development of those in the second movement, and are heard to very evocative effect in the coda, with its echoes of Berlioz’s Symphonie fantastique. In the fourth movement orchestral texture becomes an essential part of the music’s effect: the strings are muted throughout, giving a spectral quality to what is essentially a single line of running semiquavers. For the opening of the trio section Tchaikovsky recycled an idea from a cantata he had hastily written three years earlier for the bicentenary of the birth of Peter the Great. The finale mirrors the first movement as an exercise in orchestral sonority and brilliance. While for Chopin the Polonaise was a vehicle for his patriotism, proud, heroic or tragic by turns, Tchaikovsky here treats the dance as something grand and ceremonial, as he would do again two years later to convey the aristocratic world of St Petersburg at the opening of the last act of Eugene Onegin. Composée entre les deux œuvres les plus populaires de Tchaïkovski, le Premier Concerto pour piano et Le Lac des cygnes, la Troisième Symphonie évite délibérément l’expression de toute émotion personnelle profonde et fait au contraire la preuve de l’intérêt croissant que manifestait le compositeur envers une tradition symphonique plus universelle et plus objective. Elle fut écrite durant l’été 1875, alors que Tchaïkovski était dégagé de ses obligations pédagogiques au Conservatoire de Moscou. Séjournant dans les maisons de campagne d’amis et de parents, il esquissa la symphonie en à peine deux semaines mais éprouva ensuite de grandes difficultés à mettre au point l’orchestration finale. La première audition eut lieu le 19 novembre 1875 à Moscou, sous la direction de Nikolaï Rubinstein. Cette symphonie, la seule de Tchaïkovski dans une tonalité majeure, commence toutefois par une introduction dans le mode mineur, Tempo di marcia funebre ; mais cette marche funèbre est une indication de style et de tempo plus que l’expression d’un quelconque chagrin. Des phrases heurtées au ton de la dominante créent un sentiment d’attente avec une accélération progressive jusqu’au tronc principal du mouvement, dont les trois thèmes sont traités avec des éclairages rythmiques nombreux et inventifs. Les trois mouvements centraux sont orchestrés dans une veine plus légère. Le Alla tedesca, une danse allemande, est selon la description de George Balanchine «une autre des merveilleuses valses de Tchaïkovski, toute une scène de ballet délicieusement orchestrée». Le trio central conserve la même pulsation de base, mais celle-ci a l’air plus rapide à cause de valeurs de notes plus courtes – un flot de triolets de croches, avec un net parfum de Schumann ou de Mendelssohn. Les solos de vents qui ouvrent le mouvement lent, profondément expressif, en font le passage à la fois le plus russe et le plus personnel entendu jusque-là. Les motifs en triolets qui apparaissent ensuite peuvent être entendus comme l’évolution de ceux du second mouvement, et ils réapparaissent dans un effet très évocateur dans la coda, qui rappelle la Symphonie fantastique de Berlioz. Dans le quatrième mouvement, la texture orchestrale devient un élément essentiel de l’effet musical: les cordes sont jouées de bout en bout avec sourdine, donnant un caractère fantomatique à ce qui consiste, pour l’essentiel, en une simple ligne de croches ininterrompues. Pour le début du trio, Tchaïkovski recycla une idée tirée d’une cantate qu’il avait écrite à la hate trois ans plus tôt pour le bicentenaire de la naissance de Pierre le Grand. Le finale fait pendant au premier mouvement comme exercice de sonorité et de brillance orchestrales. Alors que Chopin utilisait la polonaise comme vecteur de son patriotisme, tour à tour fière, héroïque ou tragique, Tchaïkovski traite ici la danse comme quelque chose de grandiose et solennel, comme il le ferait deux ans plus tard pour dépeindre le milieu aristocratique de Saint-Pétersbourg au début du dernier acte d’Eugène Onéguine. Tschaikowskis 3. Sinfonie wurde zwischen zwei seiner beliebtesten Werke, dem 1. Klavierkonzert und Schwanensee, komponiert und vermeidet bewusst den Ausdruck tiefer persönlicher Gefühle. Stattdessen spiegelt sie die wachsende Auseinandersetzung des Komponisten mit einer weiteren und objektiveren Sinfonietradition wider. Die Sinfonie entstand im Sommer 1875, als Tschaikowski Urlaub von seinen Lehrverpflichtungen am Moskauer Konservatorium hatte. Während der Komponist Freunde und Verwandte in deren Landhäusern besuchte, skizzierte er die Sinfonie in nur zwei Wochen. Danach kämpfte er enorm mit der Fertigstellung der Orchesterpartitur. Die Sinfonie wurde am 19. November 1875 in Moskau unter der Leitung von Nikolai Rubinstein uraufgeführt. Tschaikowskis einzige Sinfonie in einer Durtonart beginnt mit einer Einleitung in Moll, Tempo di marcia funebre. Allerdings verweist diese Bezeichnung Trauermarsch eher auf Stil und Tempo als auf einen bestimmten Ausdruck des Kummers. Zögernde Gesten in der Dominante heizen die Erwartung an, wobei sich das Tempo bis zum Hauptteil des Satzes allmählich beschleunigt. Die drei Themen dieses Satzes werden mit vielen einfallsreichen rhythmischen Varianten ausgestattet. Die drei mittleren Sätze sind leichtgewichtiger komponiert. Der Satz Alla tedesca, ein deutscher Tanz, ist nach George Balanchines Worten „ein weiterer wunderbarer Walzer Tschaikowskis, eine ganze Ballettszene, vortrefflich orchestriert“. Das Trio in der Mitte hält den Grundpuls bei, klingt aber aufgrund der kürzeren Notenwerte schneller, ein Strom von Achteltriolen mit einer eindeutigen Schumann- oder Mendelssohnfärbung. Die Holzbläsersolos zu Beginn des expressiven langsamen Satzes leiten die bisher russischste und intimste Musik ein. Die spatter auftauchenden Triolenfiguren können als eine Weiterführung der Triolenfiguren aus dem zweiten Satz gedeutet werden. In der Coda tauchen sie mit Anklängen an Berlioz’ Symphonie fantastique wirkungsvoll erneut auf. Im vierten Satz trägt die Orchestertextur einen wesentlichen Teil zur musikalischen Wirkung bei: Die Streicher sind durchweg gedämpft und schaffen so eine gespenstige Stimmung für die im Prinzip in einer einfachen Linie laufenden Sechzehntelnoten. Für den Beginn des Trioabschnitts verwendete Tschaikowski eine alte Idee. Sie stammt aus einer Kantate, die er drei Jahre zuvor für den 200. Geburtstag von Peter dem Großen hastig geschrieben hatte. Der Schlusssatz ist in Sachen Orchesterklänge und Brillanz ein Spiegelbild des ersten Satzes. Für Chopin mag die Polonaise ein Vehikel für seinen Patriotismus gewesen sein, abwechselnd stolz, heroisch oder tragisch. Dagegen verwendete Tschaikowski den Tanz hier als etwas Großartiges und Feierliches, wie er es auch wieder zwei Jahre später zu Beginn des letzten Aktes von Eugen Onegin zur Gestaltung der aristokratischen Welt von St. Petersburg tun sollte.